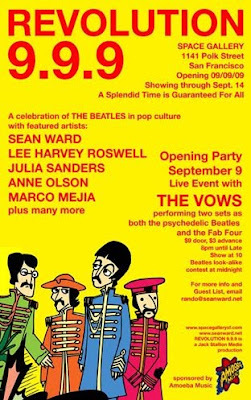 On September 9th, Space Gallery is throwing a celebration of The Beatles that coincides with the releases of The Beatles: Rock Band, The Beatles: Remastered and 'Beatles Day' @ Amoeba Records. Amoeba Records and Harmonix, the deign team behind The Beatles: Rock Band (one will be available to play at the event and will be raffled off at the end of the night!!) are sponsoring the event. The Vows will be playing as The Beatles! There's also a midnight Beatles look a like contest!! I'll have a few pieces in the show so be sure to come and join the festivities!